Emes Ve-Emunah: A Viral Chilul HaShem! This is what a lack of a secular education will do for you in a community that lives an isolated lifestyle. 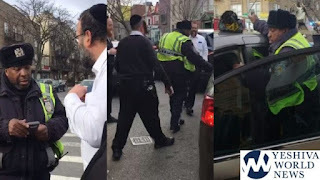 The incident shown in the video below (which originally appeared on YWN) has to be one of the most disgusting displays of behavior by supposedly religious Jews I have ever seen. It made my blood boil. I could not believe my eyes and ears. Their behavior is indefensible. And yet I have little doubt that the culture in which they live their nearly isolated lives not only tolerates it, it actually generates it. They are indoctrinated to believe they are superior to - not only every non Jew, but even every other Jew not like themselves. That is something that is becoming increasingly obvious. I don’t think there can be any doubt about that. I have heard it too many times. I am increasingly coming to believe that behavior of the people in the video below is no longer the exception... and may in fact be becoming the rule in communities like Boro Park - if it isn’t already. There is little tolerance and love of their fellow human being created in the image of God. Especially when it comes to black people! I want to be perfectly clear. There is no Jewish Hashkafa that tolerates this kind of Chilul HaShem – or any of the kind of vile racist behavior that the ‘gentleman’ in the video displayed. But don’t tell them that. They must believe that Judaism is in fact very racist. That human dignity is not a part of Judaism. That treating every human being as though they were created in the image of God – regardless of color - is some other religion’s tenet. The only question that remains in my mind is exactly how much of a community like Boro Park (where this incident took place) thinks like that? I am beginning to think that most of them do. How else could something like this happen? Let me hasten to add that the Chasidim I know here in Chicago are nothing like that. I know quite a few and not a single one would ever do anything like that. They would probably be just as abhorred by it as I am. These Chasidim are mostly not originally from Chicago. They stem from a variety of different Chasidus including Satmar. And from a variety of neighborhoods in the greater New York area – including Boro Park, Monsey, Williamsburg, and elsewhere. I can tell you form personal experience that they are among the finest people I know. So why the difference? I have to believe that is a combination of the kind of indoctrination they receive from their parents and educators about non Jews – combined with (and this is very important) living their lives in large but isolated communities. Those that have made their new homes in Chicago find themselves living in a relatively integrated society albeit heavily populated by Orthodox Jews. Of all stripes. There is far more contact with non Jews here. They see for themselves that the typical non Jew is just as human as they are. No matter what their race or religion. Perhaps more importantly is the fact they are more integrated with Jews of other Hashkafos some of whom are fully integrated in the general culture. I believe that they come to see the world more the way we in Chicago do. It is also true that the children of these transplanted Chasidim are actually provided with a secular curriculum in the Chasidic day school here. Taught by teachers (many of whom are not Chasidic) that abhor the kind of behavior this video contains. This is not the case in greater New York. There are far too many Yeshiva high schools and day schools that offer no secular subjects, and many isolated large communities where there is far less interaction with non Jews or even Orthodox Jews of different Hashkafos. They are indoctrinated to secretly hate non Jews who are inferior human beings with a not so subtle subtext that ‘Shvartzes’ (black people) are the most inferior race of all! The word ‘Shvartzes’ is in fact just be a translation of the word ‘blacks’. But more often than not it is used pejoratively. What makes this ‘incident’even worse is that there was nothing ‘secret’ about the derision and ridicule that those Boro Park Jews displayed in this video. Lest anyone ask how I know that these people had been poorly educated, one can hear quite clearly just how poor their English language skills are. No one that had the slightest bit of secular education – which would obviously include English – would sound like that! This video shows just how racist people raised in large isolated communities with no secular education can become. There is no defense. There is no explaining it away. I would hope that Orthodox leadership of all stripes would have the same visceral reaction to this sight that I did. It should be publicly condemned by every rabbinic leader who ever made a public statement about anything! No excuses! No saying that it is so obviously wrong that the mere condemnation of it is wrong – making it seem like more than an extremely isolated case of some outlier Jews. I believe that it is a lot more common than that. My experience with people living in communities like Boro Park tells me otherwise. I have heard their racist comments all too often. I wouldn’t be surprised that for every incident like this which was recorded, there are lot more that were not! These people have lost their dignity – their humanity! That they could taunt a black man for doing his job and continue ridiculing him as he rides off in his police vehicle is so upsetting… I am at a loss for words. It doesn’t matter that that police officer could have overlooked a minor parking infraction. I might even agree that he probably should have. But that is so beside the point! I hope the rest of Orthodox Jewry would have the same visceral reaction to these people that I had. They may be Jewish but they are not religious no matter what they look like. Even though they probably pay more attention to the details of ritual than I do. Maybe. Their form of Judaism is no more legitimate than Reform or Conservative Judaism. Judaism is not only about following the minutia of Halacha. It is about being a Mentch and presenting Judaism in the best possible light. These people did not do that. They failed miserably. And they probably don’t even realize it. What they did is a Chilul HaShem of major proportion. One that has gone viral! They may not realize it. But to paraphrase R’ Chaim Soloveichik, Nebech a Chilul HaShem is still a Chilul HaShem. Only this time it has spread far and wide. And I am sickened by it.